Any U.S. Junior dance team that would like to receive a bid to compete in the Junior Division at The Dance World Championship in 2019 may submit a video for qualification. Up to 6 U.S. teams (limited to one team per program) are selected to receive "At-Large" bids in the Junior Division. The number of participants that performed on the competition floor in the video at the qualifying event may not be exceeded by the number of participants competing in the Junior Division at The Dance Worlds. At the 2019 Dance Worlds, the date for age calculation will be based on the athletes age as of December 31, 2019. Athletes who will turn 9, 10, 11, 12, 13, 14, 15 or 16 between Jan 1-Dec 31 2019 will be eligible to compete. Athletes who turn 16 between Sept 1-Dec 31, 2018 will not be eligible to compete at The Dance Worlds. In the event a junior team receives a bid and there are athletes on the team that will not be eligible to compete in the Junior Division at The Dance Worlds event, these athletes will need to be to replaced using the substitution and alternate rules found in the bid packet. Be vigilant when submitting for a Junior Bid to calculate ages correctly and plan for potential substitutes and alternates appropriately. Teams may only submit an unedited performance from a USASF Member Event Producer's event that provides bids to the USASF Dance World Championship. It does not have to be from their bid-giving event. Teams submitting a video for a bid will be evaluated using the USASF Score Sheet with all styles (Hip Hop, Pom, Jazz, Kick) being judged against each other. Teams submitting a routine in the Contemporary/Lyrical genre are not eligible to receive a bid for the Junior Division at The Dance Worlds as it is not listed as an available category (see link below). At Worlds, teams will compete in the Junior Division using the IASF Score Sheet. All performances will be judged against each other and may incorporate any one style or combinations of style outlined in the IASF category listing. 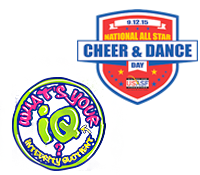 For a complete category listing, visit iasfworlds.com. Each category entry fee is $50. You may submit as many routines as you like, however only one team per program can earn a bid. Example: Shooting Stars Junior Team A can submit a Pom and Jazz routine. Shooting Stars Junior Team B can submit a Hip Hop and Pom routine. You would register each team separately and have 2 entry fees per team totaling $100 each. Selected teams receiving "At-Large" bids, along with all scores, will be announced on the USASF.net website on March 8, 2019. Let your Event Producer know ahead of time that your Juniors will be qualifying for a bid to The Dance Worlds and will need a copy of their performance on DVD/flash drive before you leave the event. In many cases, the video staff can pull your routine after your performance and save you the wait time!